Great movement and fantastic blues! 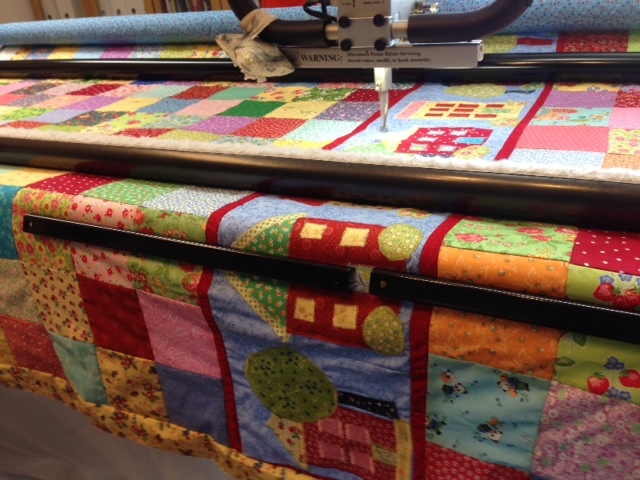 Great little quilts from this weeks quilting schedule. The fourth picture is not QUITE a quilt yet but is on my list for the upcoming weekend. These are blocks from all over the place. There are 42 total blocks donated by Mary Kay from Arizona, Evelyn from Canada, Jaynie from Texas, Mary Pat from Wisconsin, Rebecca from Utah, and Lisa from New Zealand. I will build these into a wonky quilt pattern and they will be sent to E-Quilter to be distributed to the people who went thru Sandy, the horrible storm on the East coast. So many are still without homes! It really feels good to give back to people in trouble. I hope to piece, quilt and bind this quilt and get it into the mail next week. 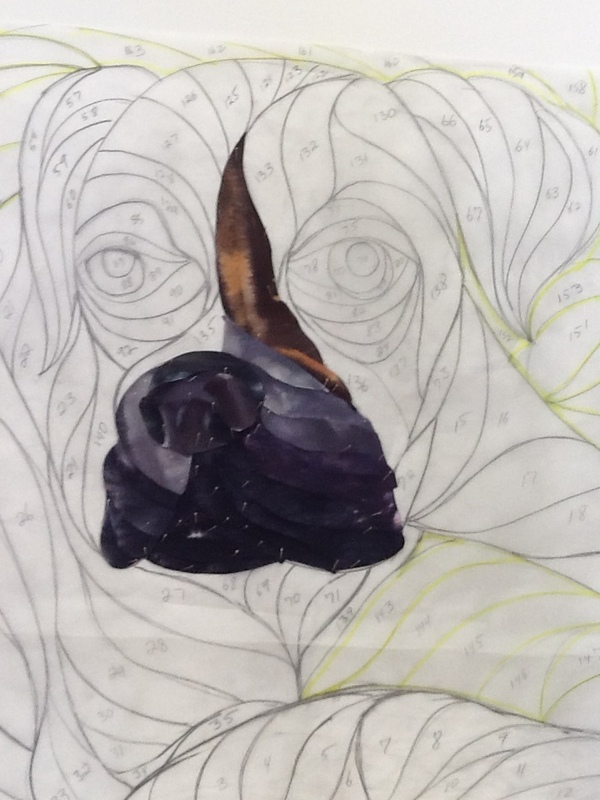 Watch for a finished picture. 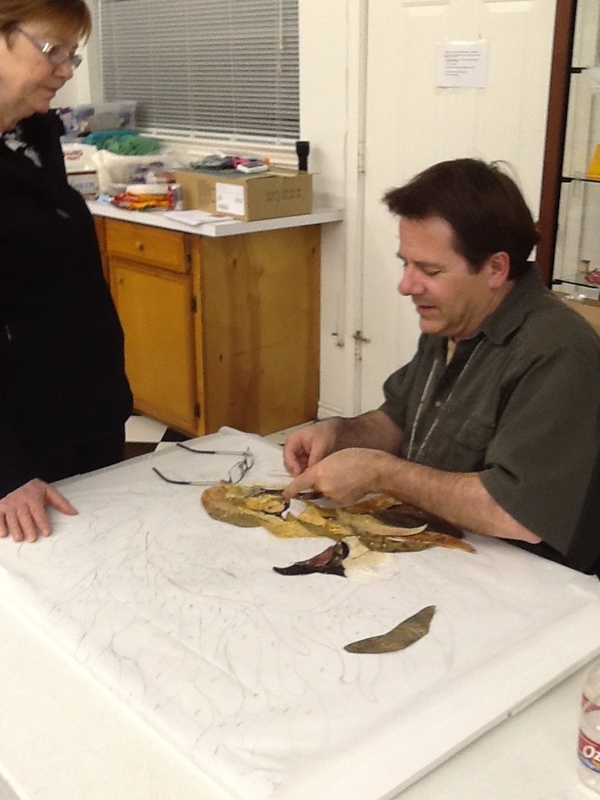 I had a wonderful time at my David Taylor class last weekend. One of the tips I learned, which I think is fantastic, is how David keeps his quilts perfectly square. Get twill tape (1/4″) from your local fabric store. Measure your quilt carefully and pin a piece of twill tape from exact corner to other corner. Do opposing sides as step 1 and 2. Be sure to pin the twill take carefully, ends, then middle, then split the difference as many times as you need to. Sew with a straight line stitch making sure the tape is right along the edge and does not extend into your quilt where the binding will not cover it. Then, measure the other two sides, excluding the first tape, pin as you did the others and stitch. THOSE EDGES AREN’T GOING ANYWHERE ANYMORE AND WILL ALWAYS BE EXACTLY THE SAME! No more uneven edges to bug you or quilt judges! At a great David Taylor workshop in LaGrange. This is my rendition in progress of my youngest boxer, Caitlin. 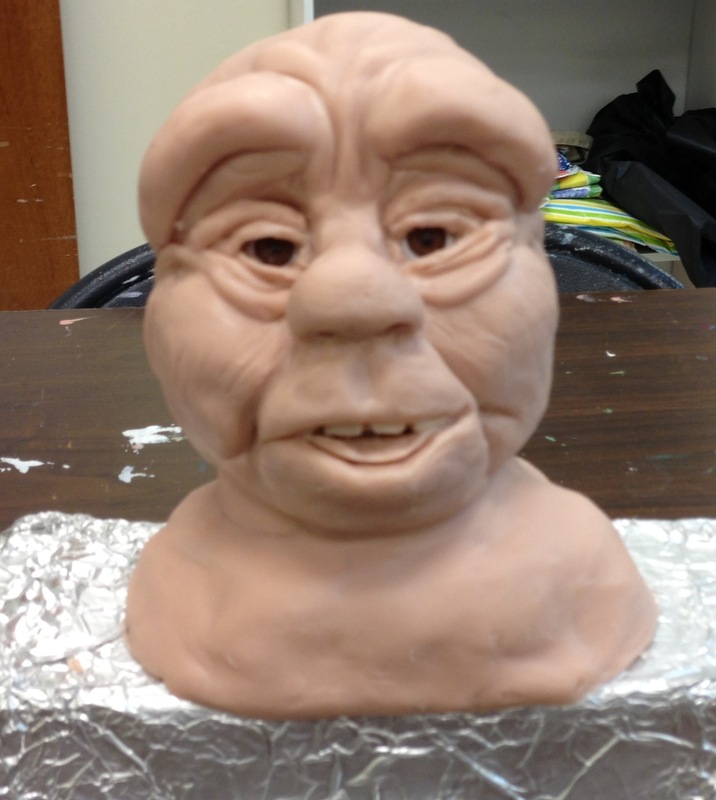 Had a great time today at our Saturday Coastal Prairie Guild class on sculpting Santa’s head. Pat is a great instructor and, despite my misgivings, she guided me on to making my Santa head..(he is cooking in the oven right now). Pictured here is my head alone and the group pic tags Pats head on your left, my head in the middle, and Candy’s head on the right! They are so cute and so much fun to make. 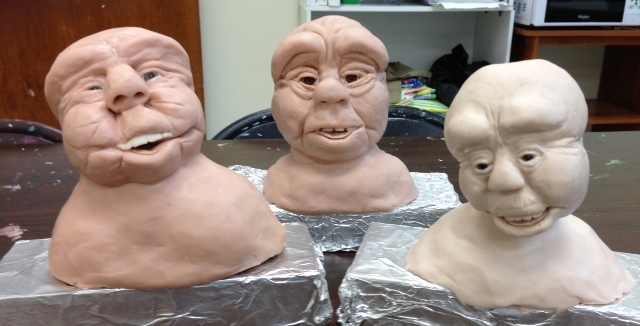 Can’t wait to see them after they get their makeup, hair, etc. The quilt picture is Jeannie’s House quilt. 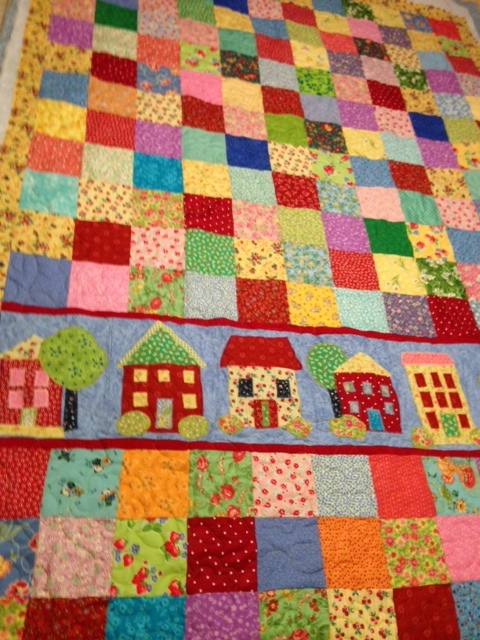 She designed the quilt and the houses. I love her fun use of color! Great quilt Jeannie! 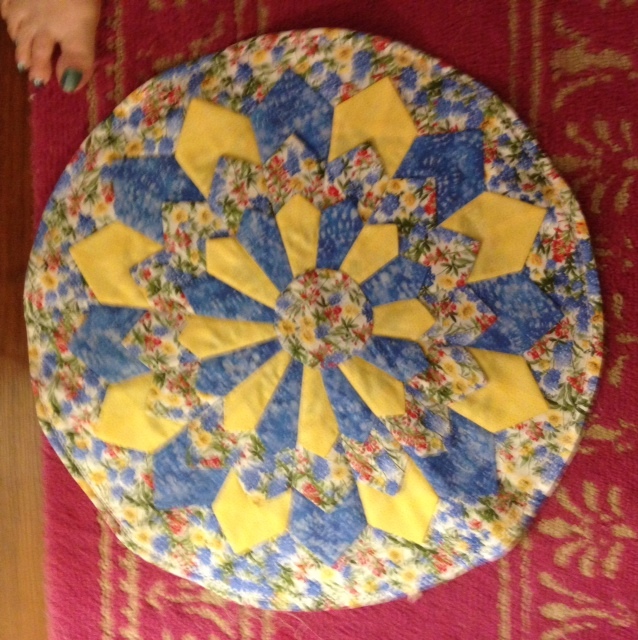 Last, but not least, is a table topper made of Texas wildflowers and made for me by my friend Joyce from Florida! 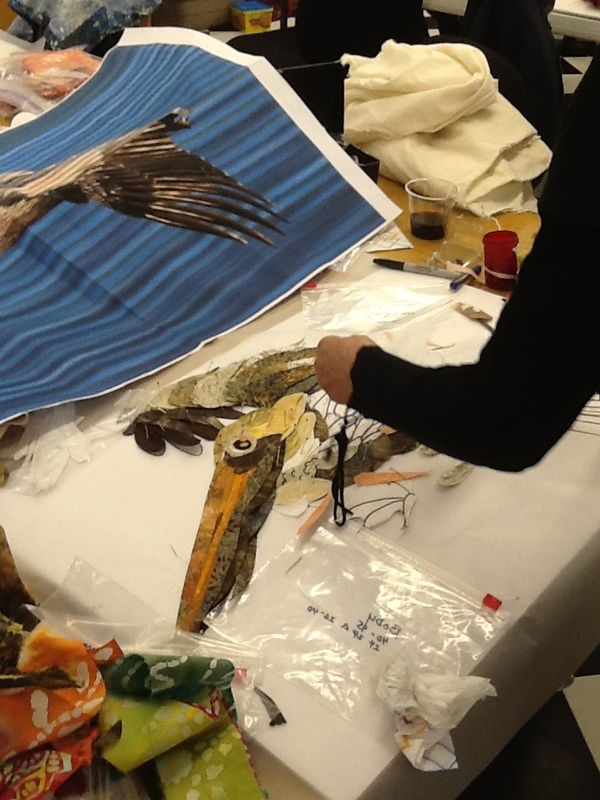 You go Joyce…it is fantastic! Hope everyone is enjoying a great weekend. meanwhile…BE HAPPY! A big Valentine hug to everyone! Hopes for lots of candy, dinner out, and especially quilty stuff! A great pattern for hearts is a free download on Sarah Vedeler Designs site. She is the designer that has designed the BOM for The Quilt Show for 2013. She has made hers out of the Dupioni Silk fabric mix that is available in quilt stores (at least thats what it looks like to me). It is very nice, modern, and very colorful. Take a look at her site. www.sarahvedelerdesigns.danemcoweb.com/ Click on the SHOP tab and scroll down to the Free Downloads pic, click there and you’ll find the heart quilt. I love color! New tool – to me! Well I finally stopped by the closest Harbor Freight in Sugar Land. 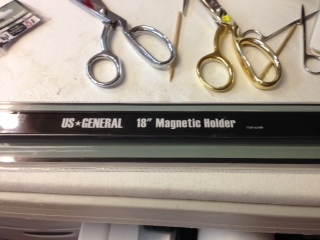 Forever I have been wanting to stop by and pick up some 18″ long magnets that help hold the quilt tops I am quilting. I did manage to get several and really like them. BUT, as important, hanging right next to my magnets was a small magnetic wrist band. It has wide elastic with a velcro closure and is advertised to hold screws, etc. that one might be working with. HOWEVER, look how wonderful it is to hold a small pair of thread snipping scissors as well as pins. FANTASTIC…this way I always have my scissors, don’t always need a pin cushion handy, and don’t have a pair of scissors poking me in the “girls”! Whoo Hoo! What a find. I love both things! Probably only longarmers would use the magnets but the wrist band is super! I have researched and find that the claim of a magnet near our computerized machines not being good is a false assumption. 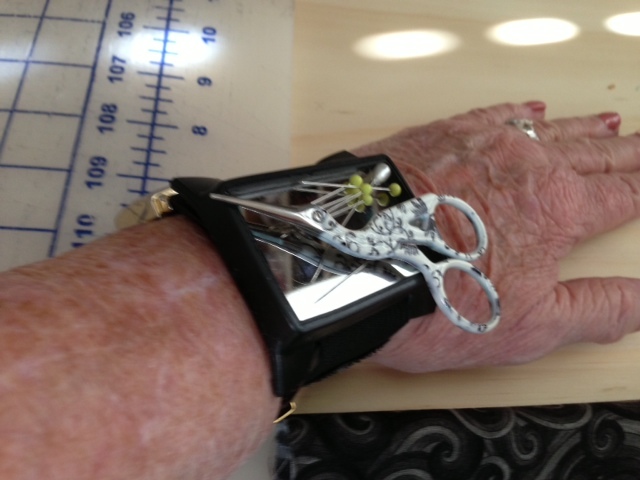 My fantastic new find – the wristband. It is truly comfortable! OK, I am way to old to be nervous about taking a test, AN EYE TEST, to boot! Can’t believe how much I am dreading going to the DMV early tomorrow morning to get my license renewed. Hopefully it will go quickly and I’ll be on my way to my quilting group for a morning of chat. Finished the last of 26 fleece blankets tonight and am delivering them to my daughter for her dance team. Used the wave stitch on my Babylock Evolve to alternate gold and green thread on the gold fleece and embroidered the team name – GOLDDUSTERS – on the corner. Hope they like it. The sew-out took 31 minutes each so I am really glad they are done!